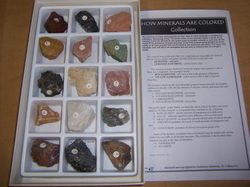 Test to Identify different minerals. Kit includes magnet, magnifier, streak plate, glass plate, a dropper bottle for vinegar and nail plus eight small samples for testing. 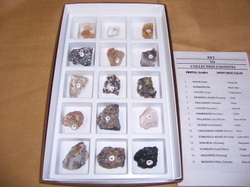 15 numbered specimens in boxed tray with identification list with questions to answer about rocks. Also includes a rock cycle chart and magnifier. 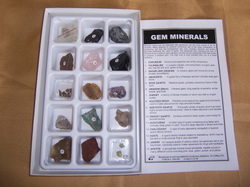 "Dig" through the gravel to find pieces of 12 different minerals and identify them by using the included flow chart. This is a fun kit. 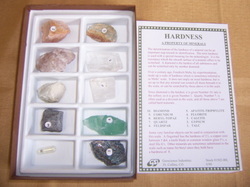 Great starter kit to help learn the wide range of physical properties: color, hardness, luster, streak, etc. 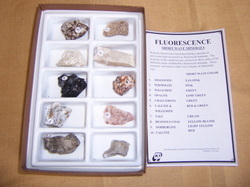 12 specimens Supplied in a compartmentalized box with identification list. 50 specimens. 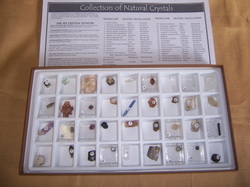 showing the wide range of mineral species found in nature and arranged according to Dana's classification. Approx. 1" samples w/ ID list. An interesting collection to show the variety of colors found in minerals. 12 specimens with identification list. Size approx. 1" x 1 1/2"
15 Specimens Approx 1 1/2" x 1 1/2". Showing minerals that are ores of various common metals. 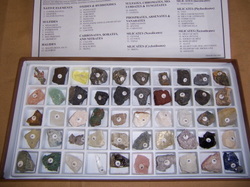 50 specimens illustrating many of the minerals and ores used in our everyday life. Comes with an ID list showing how the mineral/ore is used in industry. Size approx. 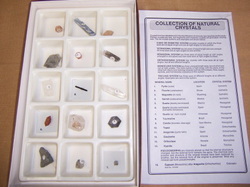 1" x 1"
15 numbered specimens with identification list showing common sources non-metal materials and minerals used in our every day lives. Specimen size approx. 1 1/2" x 1 1/2". 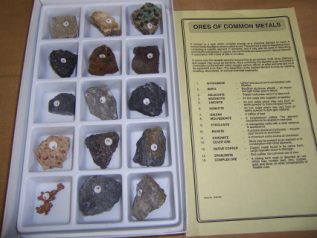 This collection is a good companion to the Ores of Common Metals Collection (1430-000) listed above. 15 numbered specimens with identification list. 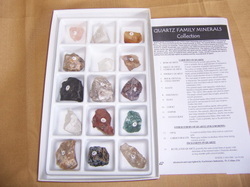 Contents of this collection illustrate the crystalline and cryptocrystalline varieties of quartz. 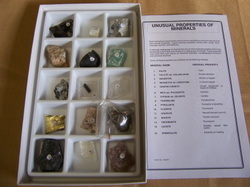 36 numbered specimens contains colorful examples of natural unprocessed minerals that can be used to make gemstones. A keyed ID list included. Specimen size up to 1" x 1 1/4". 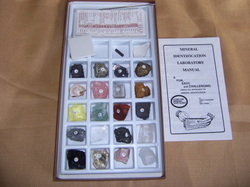 10 specimens boxed set to perform physical tests. ID list included. 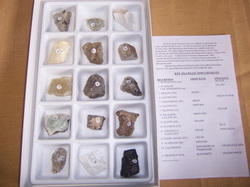 9 specimens boxed set to perform physical tests. ID list included. 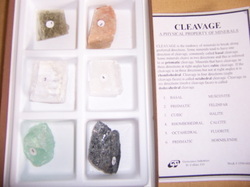 6 numbered specimens showing the types of mineral cleavage. ID list included. Specimen size approx. 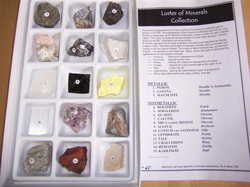 1 1/4" x 1 1/2"
15 numbered specimens illustrating the various examples of luster found in minerals (surface appearance.) ID list included. Specimen size approx. 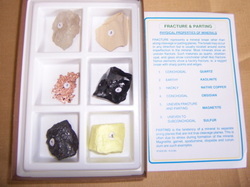 1 1/4" x 1 1/2"
6 numbered specimens illustrating the various examples of fracture found in minerals (without a smooth surface). ID list included. 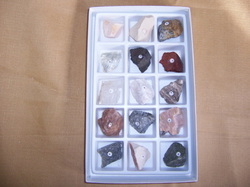 Specimen size 1 1/4" x 1 1/2"
Minerals with dramatic color and streak. The power or "streak" a mineral produces is often different from the mineral. 8 specimens. 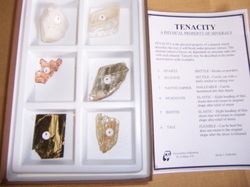 Specimen size 1" x 1 1/2"
Different types of tenacity shown in 6 numbered specimens. ID list included. 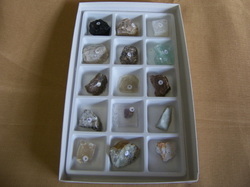 Specimen size approx 1" x 1 1/2"
9 numbered specimens showing crystal forms found in nature. Great beginner kit. Identification list included. Specimen size varies. 150 specimens with identification list. 15 specimens w/ ID list. Specimens that glow under short and long wave light. Shows example of both types. 6 specimens with identification list. 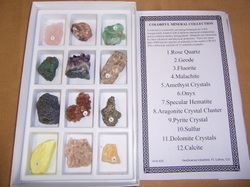 Specimens are approx 1"x1"
Dramatic color for educational display and demonstration. Minerals that glow under long-wave ultraviolet light.10 specimens w/ ID list. 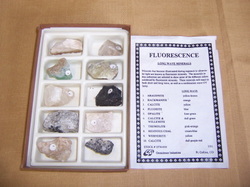 Excellent samples of fluorescent minerals that glow under shortwave ultraviolet light. 10 specimens w/ ID list. 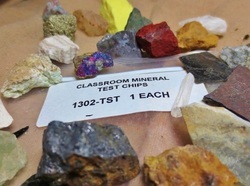 Important minerals that can be found in igneous, sedimentary, metamorphic. 24 specimens w/ ID list. Specimen size approx. 1" x 1 1/4"
Economically important minerals for such uses as fuel, ceramic, & metallic ores. The collection is housed in a compartmentalized box. 16 specimens with identification list. Elements and minerals that make up the Earth's crust. 15 specimens w/ ID list. Specimen size approx. 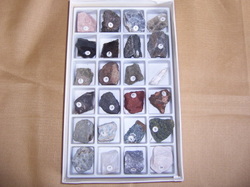 1 1/2" x 1 1/2"
Specimens included are sources of many major minerals. 45 specimen w/ ID list. Colorful raw materials that show where gems come from. 15 specimens w/ ID list. 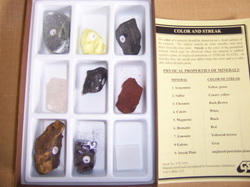 Specimen size up to 1 1/2" x 1 1/2"
Mineral specimens can be identified by using the sort cards in a process of elimination by testing the properties. 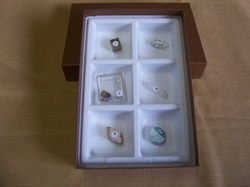 20 specimens magnet, magnifier, streak plate and nail w/ ID list. Specimen size approx. 1" x 1"